The cervical spine is one of the most important and agile parts of your body, as it is the neck region of your body. The region begins at the base of the skull and consists of 7 bones separated by intervertebral discs that allow the spine to move freely. The neck has the greatest amount of movement of any area of the spine, and is also responsible for protecting the spinal cord and supporting the skull. Because of its vital function in our everyday lives, injury or disease of the cervical spine is a very serious condition. They are most commonly known as your neck. Your neck has an amazing range of motion and it holds up your head, which weighs around 11 pounds. All of these parts wear down and can become injured. When an injury involves a muscle or ligament, the pain is usually acute and heals relatively quickly. Neck pain that lasts at least three months is considered to be chronic pain, and that’s where cervical disc problems and issues with the vertebrae are usually involved. The discs provide spacing and cushion between the cervical vertebrae. When they degenerate or herniate, neck pain that can radiate into the shoulders, arms, and hands often follows. The facet joints of the vertebrae restrict the range of motion in the spine, but also allow movement. If the protective cartilage on the facet joints wears down or tears, the joint deteriorates and the body grows bone spurs to stabilize the joint. These spurs will often press on exiting nerves, known as compression. This will lead to chronic pain in the form of tingling, numbness, and/or weakness radiating down the arm served by the nerve. Degeneration of the discs and facet joints can also cause the spinal cord to become compressed, another source of chronic pain. Dr. Todd Albert performs various surgeries in New York City to remedy the issues with the cervical discs and the cervical spine. Neck pain is highly varied. It can be something as innocent as a stiff neck or it can be continual and debilitating. Most of the causes of acute pain come from the muscles, tendons, or ligaments that help support the neck and shoulders. Chronic pain usually involves the discs, nerves, vertebrae, or the spinal cord as it runs through the cervical spine. Stiff neck — Usually acute, this pain comes when the person turns the neck from side to side. Sharp pain — This may be stabbing or stinging pain and usually occurs in the lower levels of the cervical spine. General soreness — This can be residual pain from a neck movement that was out of the normal range of motion, such as whiplash. Radiating pain — This pain can feel like burning or searing. It originates in the neck area, but follows the path of the affected nerve down into the shoulders and arms. Tingling, numbness, or weakness — These types of radiating pain usually feel like pins and needles in the arms and down into the fingers. Trouble with grasping or lifting — If there is numbness, tingling, or weakness this can lead to loss of muscle strength. Headaches — A pinched occipital nerve can cause a headache in the sides of the head of the scalp. Also, tight neck muscles can lead to tension headaches. Am I a candidate for cervical spinesurgery? Conservative treatments for neck pain begin with rest and icing. Next could be massage and posture changes. When a doctor gets involved, he or she will probably add physical therapy, prescription pain medication, and maybe cervical epidural steroid injections. If these conservative treatments don’t alleviate your neck pain, it is then likely a result of degenerated cervical discs, nerve compression, or spinal cord compression in the cervical spine. If you are experiencing these types of pain, it may be time to call Dr. Albert and utilize his expertise in spinal surgery. • To remove a damaged disc or bone spurs that are pressing on and irritating a nerve root. How Old Should You Be To Receive Cervical Spine Surgery? There are no age requirements for cervical spine surgery, but the patient needs to be healthy enough for surgery. The condition of the potential patient’s heart, lungs, and other major organs would be the only impediment to surgery to address chronic pain originating in the cervical spine. How to prevent cervical spinal problems? Shrugs — Stand looking forward with your hands holding weights at your sides. Then, move your shoulders up towards your ears keeping your hands at your sides. Finally, move your shoulders back as if you are trying to touch your shoulder blades together and rotate them. Neck extensions — Lie face down on a bed or bench with your head hanging over the edge. Then start to raise your head, as if you’re trying to look upwards. Continue until your chin is parallel to the floor. Neck rotations — From the same position lying face down on the bed with your head hanging over the edge, rotate your chin towards either shoulder. Repeat it to the other side. You can combine this with the neck extension. Lateral stretching — Standing or sitting straight up, take one hand and place it on top of your head. Slowly pull your head down, moving that ear down towards your shoulder. Pull until you feel a stretch on the opposite side of your neck. It can be difficult to know whether neck pain merits contacting a doctor. You may have slept with your head in an odd position and you’ve awakened with a stiff neck. While it may be very painful, it’s probably not something your doctor can do anything about. And it will probably be gone by nighttime or the next day. However, if your neck pain has endured and is impacting your daily life, then it’s time to see a doctor. This is particularly the case when the pain has taken on the form of tingling, numbness, or weakness in your fingers, hands, or arms. This can be a sign that a nerve is being compressed to the point that it is beginning to be damaged. If this type of compression is allowed to continue, it can lead to permanent nerve damage, which will then affect muscle movement and strength. 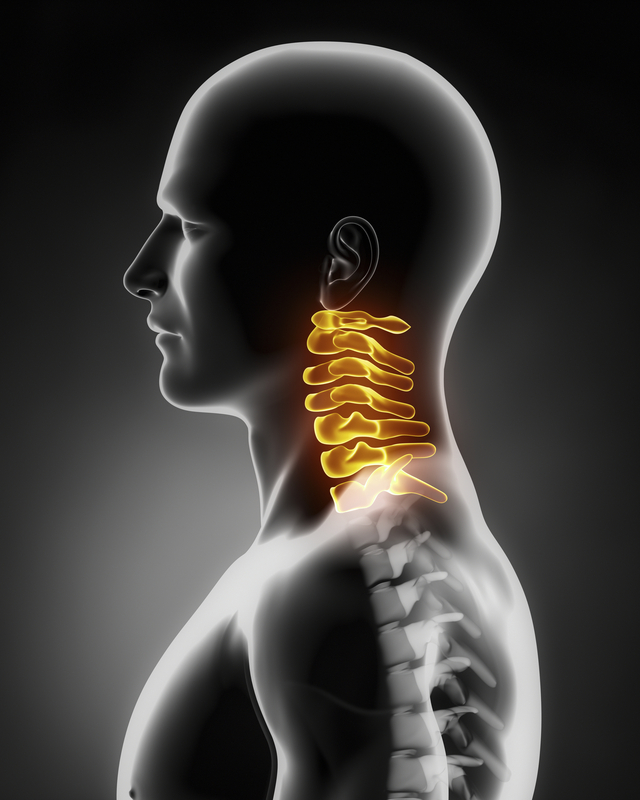 Anterior cervical decompression and fusion surgery (ACDF) consists of two major parts. The bony portion & the instrumentation. Typically, Dr. Albert does not need to take a bone graft from the hip area, meaning a separate incision is not necessary. When a disc in your neck herniates, the material can place pressure on your nerves in that area. Dr. Albert removes the herniated disc and replaces it with an artificial disc, thus eliminating the pain and returning function. This is known as cervical disc arthroplasty. The Laminoplasty procedure helps relieve nerve pressure and pain that is caused by spinal stenosis. This can be performed on any of the 3 regions of the spine. If you are experiencing neck pain, call (212) 606-1004 to schedule a consultation with New York Spine Surgeon, Dr. Todd Albert.